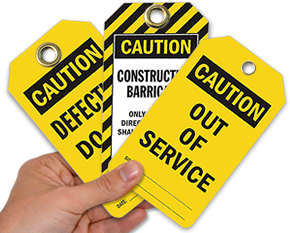 Mark your unsafe equipment with a proper attention-grabbing tag to prevent unsafe use. These tough Do Not Operate tags are your first defense against a dangerous accident. • A double-sided tag features a brass-reinforced eyelet for a firmer hold. • This yellow set includes 25 tags and 25 heavy-duty nylon ties for a complete tag set. 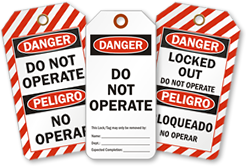 • Safety Lockout tags provide a vital message that can be attached almost anywhere. Vinyl Tag, 15 mil 6" x 3.25"
Hefty 15 mil thick vinyl material outlasts others. Tag is reusable and waterproof. Vinyl is loaded with UV inhibitors. It is great for outside use. Heavy plastic tag outlasts Tyvek and cardstock tags. Most tags come with a 1/4", 3/8" or 7/16" (inside diameter) brass eyelet for increased pull strength. 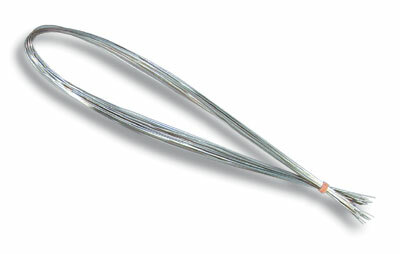 Attach tag with wires or a plastic tie. Write on this tag with pen, marker or pencil. Service was very efficient and I am happy with the product received! Thank you!